Christina Ernst began her career as a full time travel consultant in 1993 and opened her own travel agency shortly after in 1996. She graduated from Georgia State University from which she earned a Bachelor of the Arts Degree in German. Throughout her career in travel, Christina has made and maintained excellent relationships with domestic and overseas travel and tourism colleagues. She has visited over 60 countries including hiking in Brazil, polar bear viewing near the arctic circle, penguin watching in New Zealand and has visited the Alpine countries in Europe over 40 times. Christina, who speaks German fluently specializes in River Cruises & international travel and has been packaging her own Christmas market tours since 1995. She has taken over 500 travelers to over 1000 Christmas markets across Eastern & Western Europe and is currently working on an exclusive Sound of Music Holiday tour in 2019. In 2014, Christina Ernst met with her local chamber of commerce, county commissioners & local wineries to assist in promoting local agritourism. She then originated a plan to open a wine touring company. The first bus was purchased in 2014 and she currently maintains a fleet of 8 vehicles. She came up with a unique all inclusive wine tour package for travelers which was the first of its kind in the Southeast. Her business continues to grow by 50% every year and in 2015 she was presented the entrepreneur of the year from the local Chamber of Commerce. She still works full time as a travel consultant but is hands on with cultivating and growing her local wine tours. Travel Research Online (TRO): You’ve been a travel agent for 25 years. How do think travel consulting has changed, and stayed the same? Christina Ernst (EC): Consulting has definitely changed. The dynamics of the industry has changed. And, I honestly thought I would slow down as the social media and internet world kept growing; however, I have not. I focus on my past guests and referrals, which has made it easy. However, it is challenging at times since the demand for immediate response seems to be predominant. It can be difficult to shut it all down, when one can receive texts, Facebook messages, emails and calls from certain clients who expect immediate responses. However, I am at peace knowing clients are seeking me out, and I do not need to chase after them. I am passionate about travel and I believe it shows. I also make some time to skim over the travel industry trends and news, and also label myself as an expert on my business and personal pages. TRO: The Bachelor’s degree you received from Georgia State University was in the German language. Was it your original plan to use that for travel consulting? EC: Yes, however I had also studied hospitality and tourism. German was my first language but it was not taught in the local school system in Georgia. When I continued to college I wanted to perfect the language. I started taking travelers to Europe in 1995, and had already traveled abroad dozens of times so this made it a little easier. TRO: You’re an avid traveler yourself, having visited over 60 countries and done quite a lot of amazing activities in those countries. How do you think travel changes a person over time? EC: First, it builds confidence and breaks down barriers of self-doubt and xenophobia. There is something frightening, yet fascinating, when you arrive to a country that is entirely different from your own. Not just the language difference, but culture as well. I believe travel creates a desire within most people that helps you grow and learn, and builds your sense of self-worth. TRO: You seem to have quite a busy schedule; between organizing river cruises, traveling, and a fleet for an all-inclusive wine tours with VIP Southern Tours. How do organize your time, and do you have tricks that you’ve learned to help with that? EC: Managing time has always been difficult for me. Running two businesses and staying focused does have its difficult moments. However, as I’ve become older, I have realized I need to continue to grow – yet do the things I love. I have not been able to travel as exotically as I’d like since the start of the wine tour company, but I will always continue to find time to break away for my health and joy of travel as well as continued education. The wine tours truly started as a whim and an idea from previous trips. In 2014, I was speaking to a group of local business owners, vineyard owners and government officials who were looking for ways to promote and grow local tourism. The wine tour business was created out of a passion for travel and love of the area where I live. TRO: Given your experience, what would you say are the most important aspects to hone as a travel agent? EC: Trust and Honesty. There are days that I get frustrated and stressed because there never seems to be enough hours in a day, but I constantly reach out to my clients to let them know I am still working on their project and will follow up. I, like most travel agents, have experienced all sorts of client hiccups. However, about 6 years ago I changed my thought process when something potentially went wrong. I believe every problem or issue has a solution, so it is not worth stressing over since it can be resolved whether good or bad. When you change your thought process during a stressful situation into knowing you can help your clients succeed, you both succeed. TRO: Out of all the areas around the world, you seem to enjoy traveling to (and learning about) Western Europe the most. What made you want to specialize in this region? EC: I love the Old World. My parents worked 7 days a week, and what I remember most about my childhood is the vacations that we spent together as a family. We went to Austria once or twice a year to visit family, and I remember those experiences vividly. I am very passionate about Germany, Austria, and Switzerland, not only for the stunning scenery but also the culture and people. I love it when my clients are able to immerse themselves into the same. TRO: Do you have anything coming up that our readers should keep an eye on? EC: I am still very active in travel for my hundreds of clients but 50% of my business is now the wine tours. My wine tour business has actually grown 60% this winter alone, and in four short years I was able to add my 8th vehicle, which happens to be a unique panoramic bus with a glass roof and windows all around and allows clients to see more of the gorgeous Appalachian mountains and scenery as they are traveling from winery to winery. I also am very passionate about the travel industry, and understands completely how hard the average travel consultant works, so I enjoy giving discounts or working out packages which they themselves can promote. 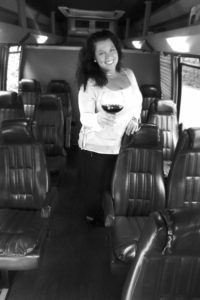 You can learn more about Christina, and VIP Southern Tours, at vipsoutherntours.com.